Officially summer is still in the city but it doesn’t feel like it. Must be the fallicious weather situation that we’ve had to deal with over the past few days. To get through rainy and windy days like these in a fashionable way a stylish trench coat is of the utmost importance. The trench is probably one of the most iconic pieces of garments nowadays, a must-have in the wardrobe of all self-respecting human beings one might say. The same applies to fashion industry. From maisons de mode like Burberry (the trench brand par excellence) and Barbour to more popular fashion multiples like Zara, H&M, Esprit, etc. every self-respecting fashion brand has a trench in its lookbook, whether it’s a classic model or an adapted and revised version of the famous raincoat. Anyway, it’s not in history class that I discovered this waterproof outerwear. 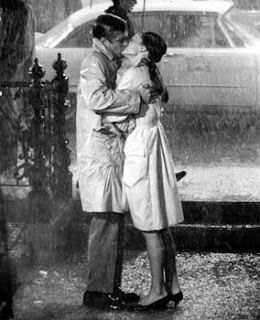 The trailer of Breakfast at Tiffany’s must have been the trench revelation to me. Ever since I first saw Audrey strolling through NY in that legendary, practical and stylish raincoat I’ve wanted one for myself. The creative interpretation of the trench that you see in the picture down below is the one that has kept me warm and dry on rainy days over the past five years. He's great yet I have to admit that I'm still dreaming about a “true” trench, i.e. a Burberry-branded one. P.S. Paradox: Trench coats are being characterized as raincoats but almost none of the ones that are in fashion have a raincap.